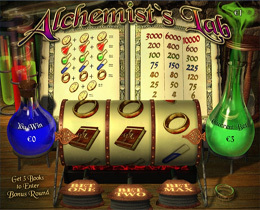 Alchemists Lab is a classic slot from Playtech with loads of fun and a Gold Making Bonus game. This slot is not like the normal slot games as the icons are laid out on a chemists scroll and the payouts appear on Science Book. Players can bet 1 to 3 coins and while the reels are spinning the realistic sound effects add to the anticipation of a winning combination to be revealed. The players bets and winnings will appear in the blue and green potion bottles that are positioned on either side of the reels. It is advisable for players to wager the maximum 3 coin bet as the 3 Gold Coins in the Jackpot will put extra rewards into the players pocket. Although Alchemists Lab Slot is one of the older classic slots from Playtech, it still remains very popular with players today.